Here at AIM, we are pleased to announce that our latest Edition of the AIM IMag is out now and free to view online! With AIM members bursting to share with you their knowledge and inspiration on village life, photography, a place for pets, a Miniature Eye on the Hebrides and a look at setting up shop in a real Dolls House Shop, this issue is yet another not to be missed miniature treat. 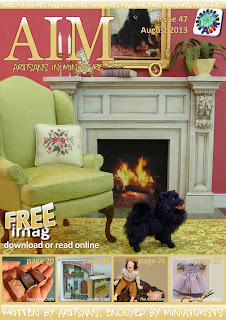 So why not grab yourself a cuppa, curl up in your favourite armchair and enjoy the 47th issue of the AIM IMag! !